Our LVTP June 7, 2018 general meeting will feature Ray Tranchant. Ray’s daughter Tessa,16, was killed on March 30, 2007 in Virginia Beach, Virginia. Tessa and her friend, Ali Kunhardt, were sitting at a stoplight when Alfredo Ramos, an illegal alien from Mexico who was intoxicated and speeding, rear-ended their car. Ramos had a history of prior convictions, but due to Virginia Beach’s sanctuary policies, he was never detained. He was charged with two counts of involuntary manslaughter and sentenced to 40 years in prison. See the short video of Tessa’s story: https://youtu.be/y-VSV8CbsvI. 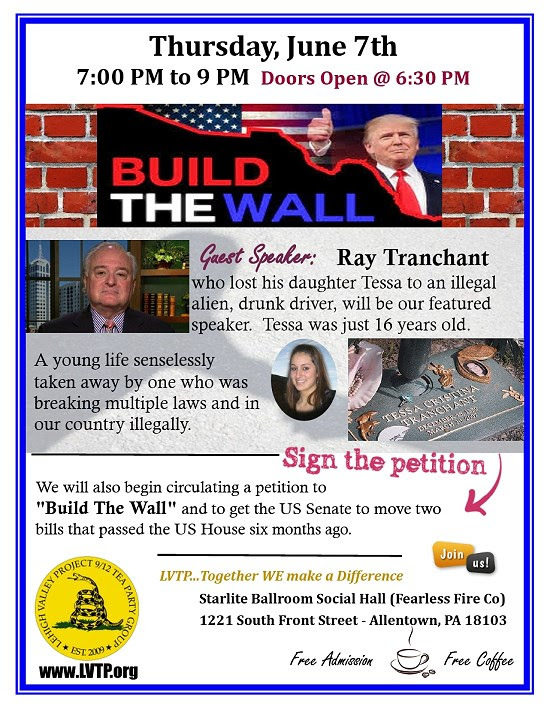 We will also begin circulating a petition to “Build The Wall” and to get the US Senate to move two bills that passed the US House six months ago. Please plan on attending our June meeting and be sure to bring a friend or two. See you then! Copyright © 2018 Lehigh Valley Project 9-12 Tea Party, All rights reserved.